This Gift Shop deals in St. Augustine Refrigerator Magnets. St. Augustine, America's Oldest City is a time capsule capturing nearly 500 years of fascinating history. Located on the uppermost Atlantic Coast of Florida, St. Augustine exudes a playful charm with a refreshing mixture of antiquated romance, youthful vibrance and Southern sweetness. St. Augustine was founded in 1565 and is the oldest continuously occupied European settlement in the continental United States. Evidence of the magic and mystery spanning five centuries in St. Augustine is revealed in more than 60 historic sites, including massive forts, missions and living history museums. The more than 20 attractions of St. Augustine are entertaining and educational for the entire family from America's first alligator farm to the world's original oceanarium. Just minutes from historic downtown lie The Beaches of Anastasia Island, which strecth along 24 miles of sun-swept shores. There you will find the waves sprinkled with water enthusiasts sailing, surfboarding and windsurfing. Incredibly fresh seafood and global delicacies are served in more than 150 eateries in St. Augustine. Options range from waterfront restaurants and shrimp shacks to gourmet bistros and turn-of-the-century Victorian mansions. The strong Minorcan heritage makes spicy tastes such as pilau and datil pepper sauce savory specialities. The nation's oldest city is truly a place where history comes alive. 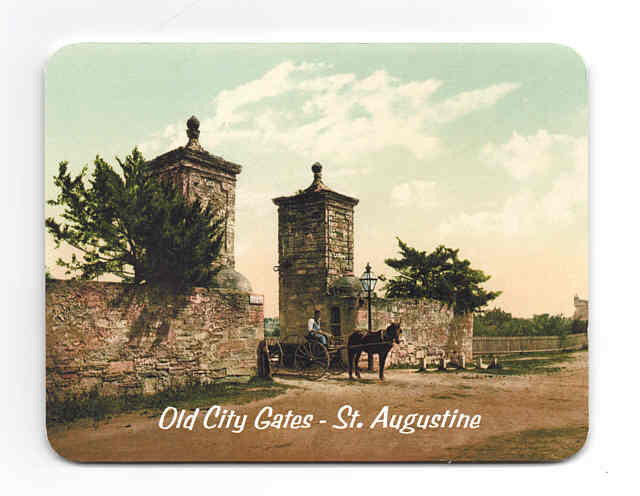 Historic St. Augustine City Gates. These Magnets are 4.5" x 3.5" in size, have a magnetic backing and a clear plastic laminate top for easy cleaning. These magnets look good on a Refrigerator, a Locker, a Tool Box, a File Cabinet or any other smooth metal surface at home or work. The magnets will be Shipped via USPS, First Class mail. Refrigerator Magnets of St. Augustine Sites available from wv-prints.com.